I will have a new vegetable gardening show for 2018 call, what else, The Rusted Garden Show. It will be about 20-30 minutes long and be specific to a theme. I will cover a lot of information and link more detailed videos to the show, so you can find more information when needed. The show will flow in real-time as it will cover what I am doing in my garden for 2018. I am in Maryland Zone 7. Below is the description to the video and you can see a table of contents. This episode is all about learning the basics for starting seeds indoors. It is a great way to see what is needed and how to avoid 4 big mistakes. Welcome to The Rusted Garden Show EP 1. It is all about indoor vegetable seed starting basics. If you are just getting started, this video is for you. I cover the cells, trays, starting mixes and lighting. Plus I review the 4 biggest mistakes you can make and how to avoid them. There is a table of contents, so you can move through the video as you was wish. 11:50 Mistake 3: Too Much Fertilizer - Use less! Sometimes it can be hard to find a really nice holiday gift for a vegetable gardener. We, on the one hand, are satisfied with a bag dirt, but on the other hand, it can be difficult to find something unique. Shirley's Simple Shelving solves that problem. Shirley sells framing systems that require no tools for setup and takedown. They are made of metal, not plastic, and constructed in the USA. You can buy units small enough for a table or large enough for 8 foot boards. In either case, you just slide the appropriate size boards into the frame and you are ready to go. I will be working with Shirley for 2018 and the metal rustic frames (below) are inspired by The Rusted Garden. You can find the frames in so many different colors but I prefer the patina of RUST. Check out her website to see her different shelving systems and colors. And if you find one that comes unfinished, in the 'Rustic' style, it is what I have currently in my garden. 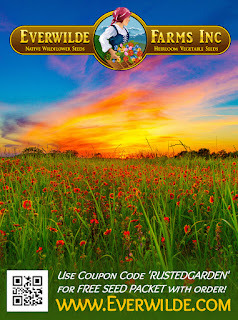 You can enter the coupon code THERUSTEDGARDEN at checkout and save $10 right now. If you purchase a RUSTIC finish, I do get a percentage of those sales. They come in 2 tiers, 3 tiers, 6 tiers and more. There shelving frames come in so many different sizes and colors. One of them will Shirley meet your gifting needs. You can find the right size for any garden. I love Shirley's shelves because the are simple to setup and takedown. You can see how quickly I set them up in my video and how I used them for container gardening. They helped me take the clutter off my deck and set up this beautiful growing area. Those are my spring seed starts you see below. The no tool construction allowed me to easily move the shelves by myself, as the seasons changed. That greatest value is that they not only helped me organize my space and free up my deck for entertaining... but they also gave me more space for planting. You can see in the video how I used the red enamel frames this spring. I color stained the boards to match the frames and it added a brilliant addition of color to my garden. They are built to last and highly functional. They would make a wonderful holiday gift. A Complete Guide to Growing Container Eggplant & How to Fry Your Harvest: Grow It Cook It Eat It! Eggplant is an outstanding container vegetable. It is extremely productive. 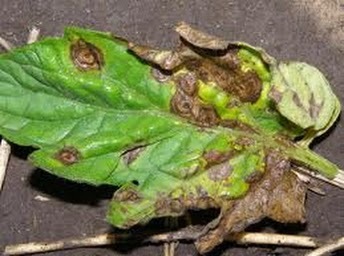 I show you everything you need to do to maintain them in containers, once planted and growing. Eggplant is the “meat” of the garden and Stacy Lyn will show you how to fry and make breaded garden fresh eggplant. A perfect golden fry that can be used with all kinds of sauces & preparations. Her cookbook, Harvest, contains this delicious recipe as well as many more!